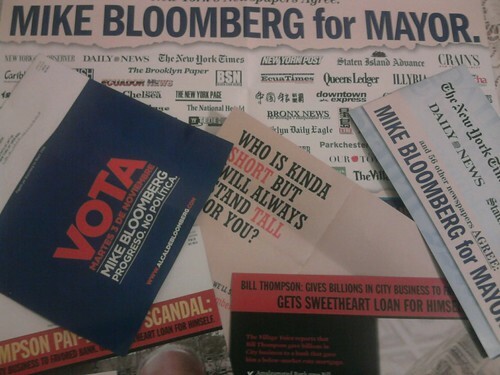 Every week I receive about five to ten pieces of junk mail urging me to vote for Michael Bloomberg for Mayor of NYC. It’s symptomatic of his big money corporatist approach to everything. There is no reason that I should be receiving this much crap in my mailbox. And, in three different languages – English, Spanish and Chinese? It offends me on a number of levels: It’s ecologically abhorent, it’s complete overkill on a marketing level, and the content of the pieces are repeative and redundant to the point of idiocy. So, it’s bad business all around. The sample above is what came just today. But, beyond that, the money spent on these mailings must be truly staggering. Easily in the millions. All during a time when a lot of people are unemployed and worried. And, as I watch the city I love turn into a Mall of America, it’s become clear that Bloomberg is part of the problem, not part of the solution. I'm so sick of our “environmentalist” mayor killing trees to repeatedly lie about his opponent. I get at least as much junk mail from Bloomberg as you do, and I'm sick of it.